While awaiting the release, later this year, of the second post-reformation album by Camden Town alt-country combo The Rockingbirds, frontman Tyler has taken the opportunity to play a few dates and release an album by his new acoustic trio, featuring long time buddy Jim Morrison on fiddle and mandolin and new addition to the 'birds nest Patrick Ralla on guitar and banjo. It is an album of two halves, part covers of his favourite artists and part a collection of previously unreleased originals. The latter make up the first five tracks, all part of his River Songs project celebrating London's country heritage and the region's hidden waterways and rural landscapes lost to tarmac. Although it's possible to detect some Guthrie influences, they're generally much more in the Anglo-Irish folk tradition than his more familiar Americana; indeed, it would not be difficult to imagine the Dubliners singing the harmonica and banjo accompanied opening number, Dirty River, a sprightly tribute to the River Fleet, the largest of London's subterranean rivers that flows under Kings Cross and Holborn (and which gives its name to Fleet Street), its two sources becoming sewers around Hampstead Heath, joining up in Camden Town before flowing to the Thames. The Ravensbourne, another lost river and Thames trbutary, is the subject of the mandolin and banjo backed Down On Deptford Creek, a nostalgic recollection of its glory days as a thriving commercial quay with the nearby Royal Dockyard now, at low tide, just the site of "filthy foraged fare, in tangled twine a Christmas tree, a broken office chair". Another harmonica blowing number, Essex Girl takes a trip down to Shoeburyness and the Thames estuary to answer the call of an old flame, only this isn't a woman, but rather Leigh-on-Sea. The most Woody of the five, Long Time No see shares a similar theme about returning home to old roots as he sings "I have been a travelling down old Hank's lost highway. I have been to Luckenbach , And now I'm back to stay" adding the wry line about how "I lost a little Charlie Rich, but I kept my Charlie Pride." The best of the bunch though is The Fields Beneath, a wistful acoustic guitar backed lament about what has been lost of our rural heritage to the march of progress as, in a dry, cracked voice, reminiscent of Red Headed Stranger-era Willie Nelson, he recalls how "just below where we now stand, on this busy avenue once an apple orchard grew." The second half turns its attention across the waters with five much covered country classics, the best of which, at least in performance terms, is Townes Van Zandt's Tecumseh Valley, the picked acoustic guitar nicely complemented by Morrison's mandolin playing and, if the jaunty mid-tempo treatment of True Love Ways robs the song of its tenderness, his respectful versions of George Jones' She Things I Still Care, Gram Parsons' Return of the Grievous Angel and Streets of Baltimore, the Glaser/Howard evergreen that Parsons also recorded. 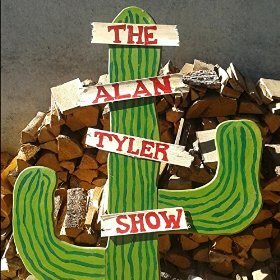 While the covers are enjoyable, and would certainly down well in any country barroom session, they're hardly essential and might be better viewed as a bonus addition to an EP of Tyler originals that certainly warrant a place in any fan's collection.